This site is dedicated to the game of dreidel: its history, its rules, and the fun of playing the game and its many variations. A dreidel is a four sided spinning top used for a game traditionally played during the Jewish holiday of hannukah. This site is dedicated to the game of dreidel: its history, its rules, and the fun of playing the game and its many variations. 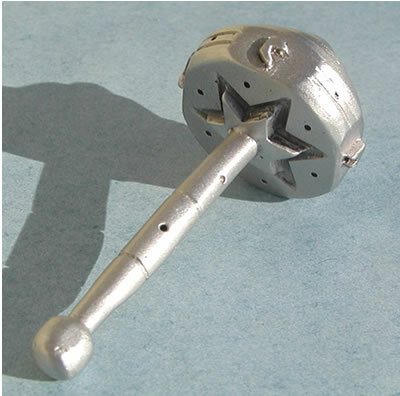 Emily Rosenfeld designs and creates a collection of cast pewter pieces of Judaica including this dreidel. I can't vouch for how well it spins - but I love the playful design. The dreidel is featured at the Jewish Gift Place - along with an interview of Ms. Rosenfeld. To celebrate the National Museum of American Jewish History grand opening in Philadelphia this weekend, here are some dreidels created not far from the Museum (and me) in Wynnewood, PA. Myer Adler (1914-1998) was the former proprietor of Harry's market in Powelton Village, Philadelphia. Mr. Adler was born in Chudnik, Poland, in 1914. When the Germans invaded in 1939, he moved to the area of Poland dominated by what was then the Soviet Union. Sent to a Siberian labor camp, he worked as a lumberjack in Irkutsk for four years, then spent two years in Stalingrad. 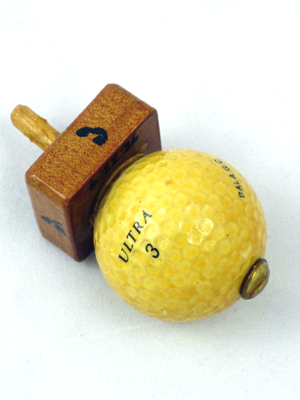 Here are Mr. Adler's dreidels - starting with my favorite one made from a golf ball from the Bala Golf Club. (These images are published with permission from the NMAJH and may not be reproduced without their consent). 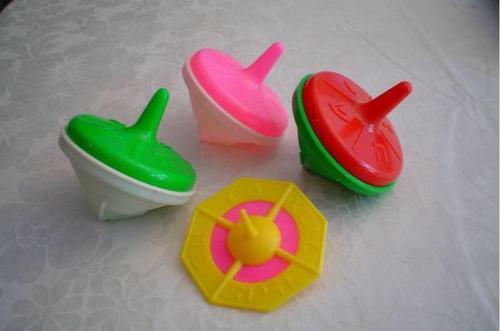 Many of the typical plastic dreidels seen here in the US are made in the classic boxy form - but there a number of more off-beat and colorful plastic dreidels out there. Here are a few vintage plastic dreidels from Israel and elsewhere. 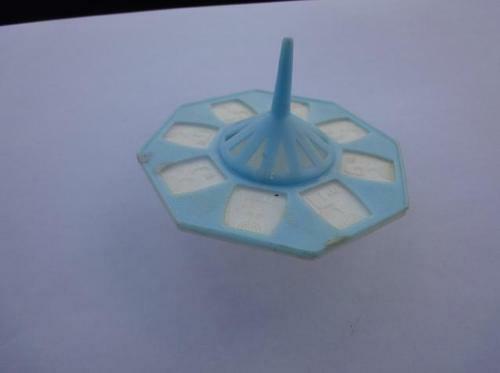 Vintage Plastic Israeli Dreidel available on Ebay. Images of more plastic dreidels are in the dreidel gallery at boardgamegeek.com. Tomasz, a dreidel collector from Lodz, Poland sent me a fabulous picture of his collection of pre World War II lead dreidels. (Click on the picture to enlarge). These dreidels were given to him by family members or purchased from other collections. He may be interested in selling some of the set - feel free to contact me if you are interested. 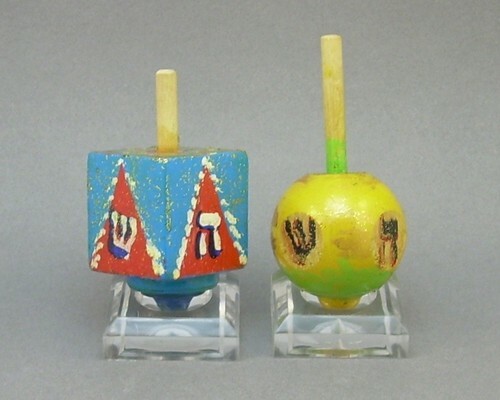 For more about dreidel top variations - check out my posting on dreidels from around the world. Just learned about a Greek version of dreidel! Apparently Parta Ola is a spinning top game from Greece, traditionally played around the Christmas and New Year Holidays. My neighbor plays it with his family at Easter. Here is a site that sells not only the Greek version - but also the English Put and Take and the Spanish Toma Todo. What is nerdier than an adult that plays dreidel? 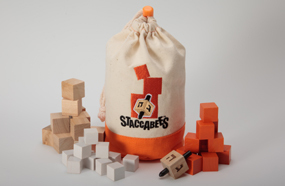 Introducing... STACCABEES™ an exciting all wood dreidel game for ages 6 and up. It involves a little strategy, a little luck, and a lot of poise - be the first person to stack all of your cubes and you win. It's an all wooden game made of responsibly harvested North American hard wood. Game pieces were assembled by a 100-year old company in Maine. STACCABEES™ takes about 20 minutes to play. The game is for ages 6 and up, but adults who've played it so far think it's really fun. Light weight, durable and portable, STACCABEES™ is easy to tote around to holiday parties and family gatherings. STACCABEES™ can be used for fundraisers. Please email me for details. After a long search he found a tool and die maker who designed the world's only existing draydel casting machine. Lead is heated in a steel ladel till it melts. The molten lead is then poured into the closed mold. After 15 seconds, the lead sets, at which point the mold is opened and the hot draydel is removed. A good operator like Fannie produced about 75 draydels an hour. The first year was a great success and the exultant duo sold 25,000 lead draydel at 2 cents each, for a total of $500.00 Hallelujah! Life for Asher and Fannie was looking up. According to the New York Times, Ktav now sells 400,000 dreidels every year. I'm guessing that not of these are lead :). 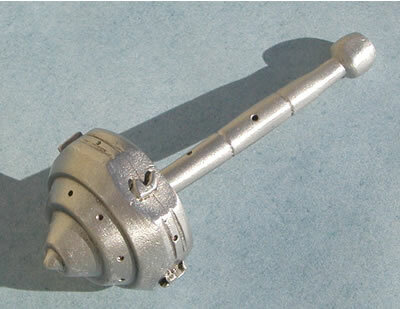 Cast dreidels are generally well made because the shape of the piece can be precisely controlled. Unfortunately, many of todays cast plastic dreidels are sold with a part line going right across the tip of the dreidel. 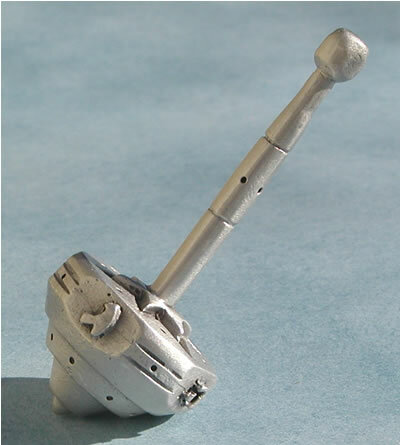 A part line is the line between the two sides of the casting molds where a bit of material always oozes out. This can be removed but these are cheap dreidels so this extra work is skipped. In contrast, dreidels cast of sterling silver, pewter, brass, bronze, nambe or any other more expensive material typically have had the part line removed - and are are more likely to be well balanced. Lead is out of vogue these days not only because its more expensive than plastic but also because of health concerns. The dreidels below are remnants of a past era! 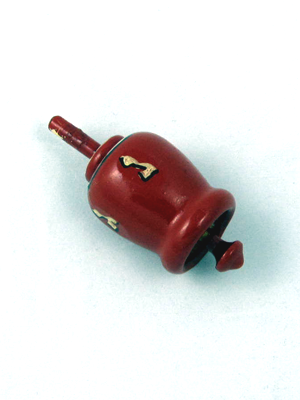 Lead Dreidel supposedly from Eastern Europe, late 19th century. Top and bottom are decorated with engraved ornamentation. Measurements : Height: 4.2cm. / 1.65in. Weight : 17.8g. / 0.57oz. Price: $750 (as of 12/16/08). Available from Pasarel. 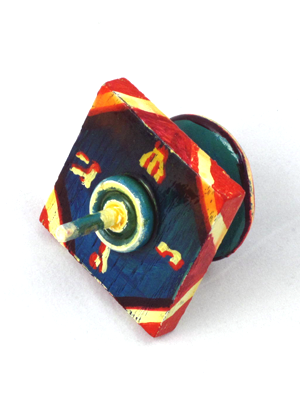 This vintage Israeli lead dreidel , was hand made by a jewish artist in Israel. Along with the letters are Words in Hebrew that state that the dreidel used to belong to the Bialik school. Height: 2.54cm/1in. Diameter: 1.25cm/0.50in. Price: $49.99 (as of 12/16/08). Available from Mir-El Antiques. This early metal dreidel measures about 1" high and about ½ inches in diameter. Each Hebrew letter is embellished by a Star of David. It is unpolished. Price: $35 (as of 12/16/08). Formerly available on Ebay. 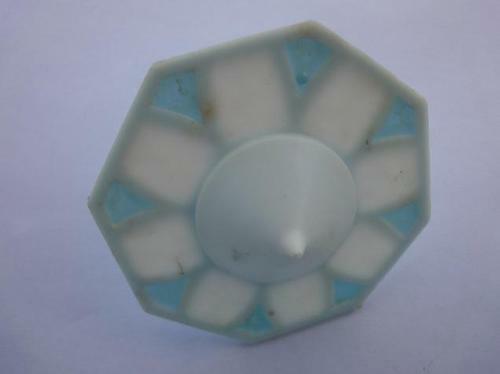 Here are a couple of web sites that regularly sell antique dreidels. Please note that I have not personally done business with these vendors - so this is just a list - not an endorsement! These dealers have received a positive review from a reader of this blog who purchased dreidels from them. I have not heard any reviews about these dealers. Apparently there are lots of fakes available on ebay and the internet - so beware! 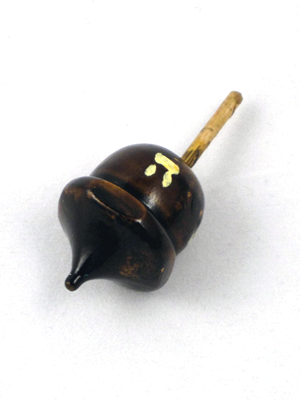 If you do purchase an antique dreidel, the best way to get help authenticating it is to contact a reputible antique judaica dealer. Driedel made in traditional Turkumen style. Learn more. Paper dreidels by Nitzan Shmueli. Learn more. Dreidel by Melanie and Harry Dankowicz. Learn more. Ceramic dreidel by Stefan Egei. Learn more. 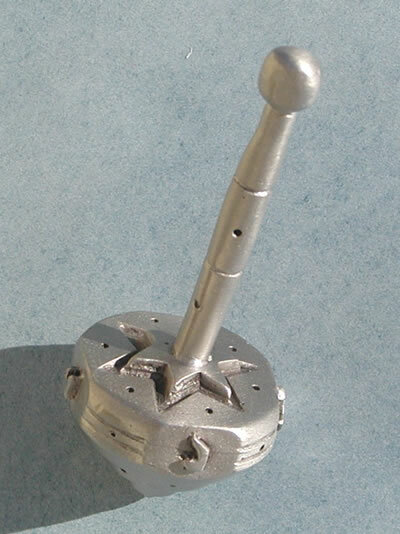 Dreidel made of Jerusalem Stone. Learn more. Dreidel carved from a Saguaro Cactus. Learn More. Colorful, well made wood dreidels for a buck. Learn more. Laser Cut Wood Dreidel by Cheryl Olney. Learn more. 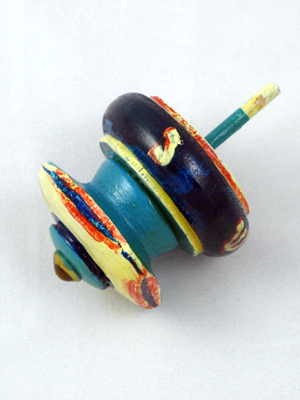 Original wooden dreidel from Dr. Herman Berliner's dreidel collection. © Copyright 2008 Daniel Singer. All rights reserved. All times are USA Eastern.